Fr. Louis Vitale, Pace e Bene’s Action Advocate, was arrested on Sunday morning, November 22 at Ft. Benning, GA as part of the annual gathering of thousands of people calling for the closure of the School of the Americas organized by SOA Watch. He and three others — Nancy Gwin, of Syracuse, NY; Michael Walli, of Washington, DC; Kenneth Hayes, of Austin, Texas — crossed into the base. All but Walli have posted bail and been released. Fr. 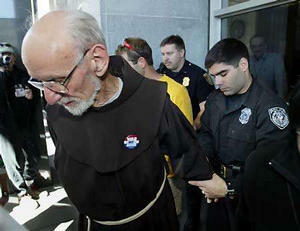 Vitale previously served a three month prison sentence for engaging in nonviolent civil disobedience at Ft. Benning. Further reading on the SOAWatch demonstrations of 20-22 November. Fr. Louie Vitale and Fr. Steve Kelly took a stand against torture. to their call for an end to torture and war. Yes! I want to join the Pace e Bene Circle of Peace!